Cat language goes beyond the vocalizations that typically include hisses, growls, chattering, and meows. Nonverbal language such as tail talk offers many advantages over vocalizations. Additionally, sounds give away a cat’s location to adversaries, while posturing can’t be overheard. 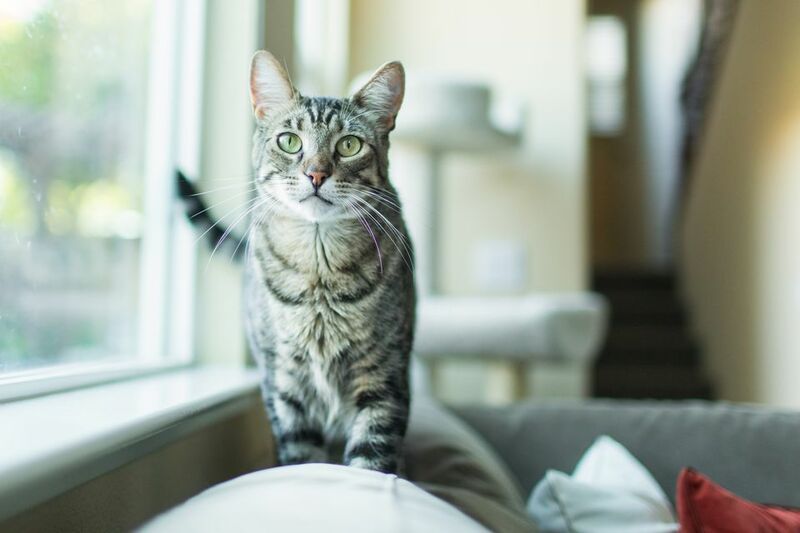 To many owners surprise, feline communication is primarily done through a cat's ears, which holds tons of useful information regarding a cat's mood or next course of action. Nonverbal communication lasts longer. Just as sign language can be sustained nearly indefinitely with no need to stop and take a breath, the silent semaphore language of cats is done via facial expressions and body positions. An owner's cat's eyes can show the inner feelings of the pet. For example, cats that are content and happy tend to have non-dilated eyes that are open or somewhat closed. Cats who are currently at ease may create eye contact and hold a gaze with their owner for a few moments. On the other hand, cats that are either aroused or feeling aggressive will have a dilated or constrictive eye shape. Luckily, owners can read a cat’s mood in additional forms of body language, such as by the simple way his or her cat holds their ears. Below are four different ways that cats express their feelings through their ears, from emotions like curiosity and uneasiness to agitation and fear. The forward facing ears that cats make express interest. This also serves to point the funnel-shaped pinna (external ear flap) toward interesting sounds, to gather as much information about the situation as possible. Owners can notice that even during cat naps, their kitty keeps those ears pointed toward even the most subtle noises. As a cat feels threatened or uneasy, ears turn toward the side. They look a bit like airplane wings jutting from each side of kitty’s head. This also helps buffer any upsetting sound that comes from that direction. Sideways-facing ears also are more protected. Owners can consider the “airplane ears” to be early ear-warnings to back off and stop whatever has prompted the cat to feel threatened. Flickering ears indicate rising agitation. The sideways-facing ears flutter or vibrate very quickly, in an involuntary reaction to high arousal. If the dog, person, other cat causing the arousal does not go away, the cat may progress to threat or attack. Fearful or angry cats flatten ears tight to the head. This keeps the ears out of the range of claws and teeth, in the preparation for either fight or flight. Cats with slicked-back ears will attack when their owners ignore the warning. Ears are simply a kitty barometer that can help owners anticipate and avoid potential problems. When an owner's cat acts out with petting aggression, they can watch for the ears turning sideways or the tail thumping, which will tell them when to stop or pause.